Wouldn’t automatic generation of natural-sounding text from raw data simplify many work-tasks? The applications are endless, from robot journalism to automatic generation and uploading of thousands of product descriptions to eCommerce systems, generation of business reports, and much more. 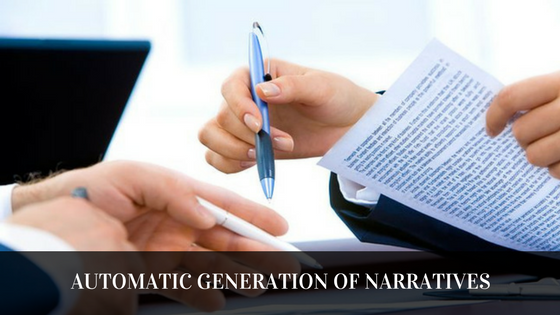 Narrative Science is a company that offers an AI-powered product that converts data to human-sounding narrative. Their product is called Quill, and I got the opportunity to discuss this with Aimee Rowland, the Director of Product Marketing at Narrative Science. Now, over to the Interview where Aimee explains more about Quill and automatic generation of text from data! Narrative Science is an enterprise software company based in Chicago, with offices in New York, D.C., and Seattle. It started as an artificial intelligence research project at Northwestern University between the School of Engineering and the School of Journalism, with the goal of understanding how to tell stories from data. After being incorporated in 2010, the company quickly grew into an industry innovator focused on helping enterprise companies use the power of storytelling to drive better business decisions. By transforming data into an actionable asset, these companies can increase operational efficiency, enhance customer engagement, and fuel product development. What Problem Does Narrative Science Solve? Quill​ is a patented Natural Language Generation (NLG) platform, powered by artificial intelligence, that automatically creates human-sounding, data-driven narratives at enterprise scale– empowering those that are business literate, but may not be data literate, with timely, relevant, and intuitive information. What Does Narrative Science do, and why is it Important to Your Customers? At Narrative Science, we’ve built our NLG technology to communicate insights from data in a way that highlights what is most relevant to each intended audience. With a deep understanding of the meaning behind the data, we help enterprises scale the delivery of contextually-relevant information in the most intuitive way possible– a data-driven narrative. Our machine generated narratives update anytime the underlying data changes, delivering timely information that readers can immediately understand and act on. Our technology surfaces the most interesting and important facts from data — providing relevant insights for each intended audience. It does this by performing context-aware analysis that is performed in service of what needs to be communicated. Our NLG engine produces human-like, intuitive language. It automatically utilizes variable word choice, understands when it’s best to combine sentences, and identifies the appropriate pronoun usage, verb tense, and grammar to produce fluid, conversational language that is easily consumable. By updating whenever there’s a change to the underlying data, our NLG technology can automatically scale the communication of information and generate audience-specific narratives — no matter how large or diverse that audience. How Does Narrative Science use AI? Natural Language Generation (NLG) is a subfield of artificial intelligence (AI) that produces text output from data input. It is the computer’s ability to extract facts from structured data and express those facts in human-like language. Customers expect relevant information at their fingertips, yet organizations struggle to deliver a customized experience to each individual. AI has the power to deliver personalized information at scale, in a way that is easily accessible and consumable. We envision a world ​where our interactions with technology are conversationally-based. Think Alexa, Siri and chatbots — for the enterprise. The application, powered by NLG, will be able to respond immediately with an explanation and sound advice she can understand and act on in an interactive, conversational manner. AI is certainly disruptive, but our view is that it will ultimately augment marketers’ expertise rather than replace them. A trend has been developing in the enterprise for several years around increased connectivity and digital transformation. As this trend has grown, marketers are being inundated with exponentially more data in their jobs. The result has been a shift of responsibility on workers to do not only their jobs, but also become experts in data analysis. This is not always an efficient process nor a good use of a company’s talent. Machines are better at analyzing large volumes of data, leaving marketers to accomplish higher-value tasks. In this interview, Aimee Rowland gave a fascinating insight into how AI-tools are now capable of generating human-sounding text from raw data automatically. Such tools can undoubtedly improve the efficiency in terms of texts that are based on data.